Media lessons, research, and digital literacy just go hand-in-hand with language arts classes, so first priority has always been given to those teachers when scheduling library time. With the focus on STEM and incorporation of science and math initiatives, I began looking for ways to get math classes into my library. 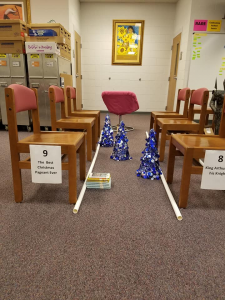 The initial project came in the form of literacy-themed mini golf courses in the media center. I began the project by approaching two sixth-grade math teachers with the idea of using a mini golf course to collect real-world data for students to use when calculating mean, median, and mode. Both teachers were receptive, so we set a date, and I got busy creating book-themed greens and scorecards for data collection. The teachers reviewed the content vocabulary in class, divided their students into groups, and prepared the students for their day in the library. I set up nine holes using either the bookcases or PVC pipe as the bumpers for each course. Thankfully, our PE department had golf clubs we borrowed and one of our teachers who golfs donated used golf balls. I later found clubs at a local thrift shop and picked up twelve for under fourteen dollars. For each hole, I used several copies of the title I had chosen for that hole as well as a few physical obstacles that related. 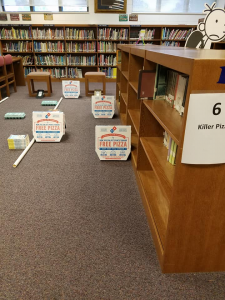 For example, for the book Killer Pizza, I asked the local Dominos for empty pizza boxes and used the book as another obstacle. Mini golf day arrived with lots of excitement. Imagine twenty-five sixth-graders per class period with golf clubs moving around in the library. Amazingly enough, there were no injuries. The teachers and I set clear expectations as we explained the flow of mini golf, etiquette, and process for recording the scores. When students had cycled through the entire course, they returned to their table to calculate totals, mean, median, and mode. We discussed the data as they made connections between the activity they had done and the numbers on their scorecards. They truly understood the meaning of the data they had collected in relation to the vocabulary being taught in class. With any new activity, there is always a trial and error aspect that results in lessons learned. For the first class, I did not have backdrops on the course that kept the balls from going out the back of the green. For the remaining classes, we used foldable cardboard study carrels to close in the backside of each green. We had also used very light practice balls that bounced all around the room. We switched to actual golf balls for the rest of the classes which were able to be controlled much better. I chalk up this activity as a success, not because I achieved anything literacy-related other than creating book-themed courses, but because this partnership with math shows the students that the library is for everybody in every subject area. The greater success occurred when the math teachers asked how we could collaborate on further projects. Those standards for ratios and percentages will be taught soon, so we’re working on an idea for collection analysis by Dewey Decimal category.